Elim Chew is the Founder and President of 77th Street (S) Pte Ltd, a streetwear fashion and accessories retail brand in Singapore. She also co-founded a social impact business – FastFast, an app providing fast, on demand delivery services to consumers within 90 minutes, while giving a source of income for people who need it. With passion in the entertainment industry, she joined as a shareholder of BMBX, a company amplifying Southeast Asia’s music and culture. She sits on more than 20 boards and committees of public service, youth and community organisations such as MINDEF (ACCORD), School of the Arts and Social Lab Ltd. Elim recently launched her new Youtube Channel, which features changemakers around the world who are making a positive impact to society and have an inspiring story to share. As a mentor and friend to many youths and aspiring entrepreneurs and social entrepreneurs, Elim inspires and encourages all to be ‘changemakers’ in their own fields. 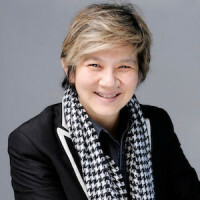 Elim is humbled by awards for both her entrepreneurial and philanthropic efforts, such as Most Promising Woman Entrepreneur in 2001 by the Singapore Association of Small and Medium Enterprises, Montblanc Businesswoman of the Year 2002, Young Woman Achiever 2003 by Singapore Press Holdings and Singapore Promising Brand Award 2004. She is honoured as a Forbes Asia Hero of Philanthropy 2010 and early 2011, she received the Responsible Leadership Award and the Community Engagement Award from the Asia Responsible Entrepreneurship Awards 2010 and the Outstanding Young Singaporean Award 2011 – Commendation. In the same year, she also became the recipient of the Singapore Public Service Medal (PBM) 2011. Elim is also an advocate for social entrepreneurship in Singapore – a movement of using business models to solve social issues to bring about sustainability to the marginalized. She believes that businesses can do well and do good at the same time to create a more sustainable, inclusive and a better world.